CCHSA Faculty Dr. Debra Morgan is one of the six-member panel of multidisciplinary experts who compiled the report. A Canadian Academy of Health Sciences expert panel on dementia released their report January 16, 2019 outlining priorities for a national dementia strategy. Visit CAHS to download the Assessment. The assessment entitled Improving the Quality of Life and Care of Persons Living with Dementia and their Caregivers was conducted by a six-member panel of distinguished multidisciplinary experts including Dr. Debra Morgan, PhD, RN, FCAHS, Chair, Rural Health Delivery at the Canadian Centre for Health and Safety in Agriculture, University of Saskatchewan. The panel is chaired by Dr. Howard Bergman, MD, FCFP, FRCPC, FCAHS, Chair of the Department of Family Medicine at McGill University. 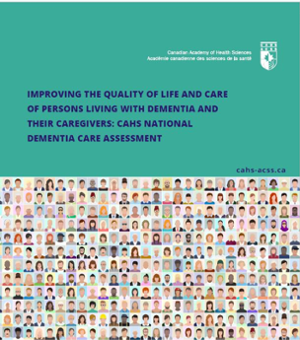 The Public Health Agency of Canada charged the panel with providing an evidence-informed and authoritative assessment on the state of dementia knowledge to help advance and inform the development of a National Dementia Strategy. "The panel recognizes the geographic, demographic, and cultural diversity in Canada and the need to ensure inclusivity and equity in developing a national strategy." Improved quality and access to care for those living with dementia and improved supports to caregivers were stressed as well as the need to invest in dementia research and innovation across all areas of dementia - biomedical, clinical as well as research related to health systems, health services and population health. Rural older adults with dementia face multiple disparities accessing health care services, such as fewer services, greater travel distances, lack of transportation, lower availability of highly trained staff, and difficulty providing continuing education to health care providers.